WORLD football governing body (FIFA) has lifted the two-year ban slapped on celebrated football star Kalusha Bwalya. A brief statement on the FIFA website yesterday confirmed the development saying Kalusha had been reprieved and his suspension lifted partially. The statement said Kalusha’s ban had been reduced and the former FAZ boss was free to resume football activities after an earlier ban by the Ethics Committee banned him from all football activities. The Ethics Committee had on April 12 last year banned Kalusha for two years and fined him CHF10, 000. The statement said that the appeals committee had partially upheld the appeal lodged by Kalusha and reduced the sanction imposed by the adjudicatory chamber of the Ethics Committee. “After analysing and taking into consideration all the circumstances of the case, the FIFA Appeals Committee decided to reduce the duration of the ban from taking part in any football-related activity imposed on Mr Bwalya to the period already served at the time of the notification of the present decision,” the statement said. With Kalusha having already received this notice, his ban from football activities has been lifted with immediate effect. But the Appeals Committee upheld the fine on the former head of CAF technical committee. “Furthermore, a fine of CHF10,000 has been imposed on Mr Bwalya,” read the statement. 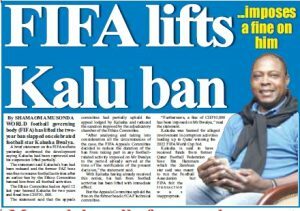 Kalusha was banned for alleged involvement in corruption activities leading up to Qatar winning the 2022 FIFA World Cup bid. Kalusha is said to have received funds from former Qatar Football Federation boss Bin Hammam which the Zambian star said was meant to run the Football Association but FIFA felt the transaction was inappropriate.